Recipe, photography & styling by Tanya Zouev. It’s been a busy week of writing and blogging and for this post I collaborated with MamaBake, to discuss the global issue of food waste. Think Eat Save, a campaign to reduce global food waste was launched on January the 22nd by The United Nations Environmental Program (UNEP) and Food & Agricultural Program (FAO). The campaign’s message is to raise awareness of exactly how much food ends up being thrown out not only by industry, but by households like yours and mine. After reading the statistics I was somewhat shocked, I knew that the figure was high, how high exactly? UNEP announced that around a third of the world’s total food production ends up in landfill. Aside from being an alarming fact, what is even more alarming is that if we were to redirect this food to people who need it then no one would go hungry. By my own admission I am as guilty as the next person for wasting food at some point in my life. However for the last eight years I have made a conscientious effort to reduce the rubbish that my family and I produce, particularly in the area of food waste. I’d like to share with you how I came to be aware of it and what I’ve done about it at my end. I am a professional photographer and I became involved in photographing food for the publishing industry about twelve years ago. It was on these shoots I noticed a lot of food being thrown out by the crew and I started querying as to why. I was told it was because once the food was photographed it wasn’t needed any more. I didn’t understand why an entire turkey for example, was used for just one photograph for fifteen minutes would mean that it had to be thrown out. All I could think of what that someone could eat and gain nourishment from it, and that by that someone eating it, the food would stay out of landfill. A great deal of food is purchased on shoots for the reason that if a recipe doesn’t work or needs changes, the photo chef has enough ingredients to re-make dish. Generally too much is purchased and there is always a lot of food left over. The crew usually eats some of the leftovers for lunch, some take a little home, but for the most part nobody wants it and it ends up in the trash. So I searched for a solution. It was in 2005 that I scoured the internet for agencies and shelters I could donate the food to and I came across Sydney based charity, OzHarvest Food Rescue. They came to my studio, provided me with containers and from there I started donating food from almost every shoot. OzHarvest was established in 2004 by founder Ronni Kahn. At the time she was working in the hospitality industry and rather than stand by watching immense amounts of food being thrown out she decided to put a plan into action and OzHarvest was born. OzHarvest are now in most Australian capital cities and drive around distinctive refrigerated yellow vans collecting leftover food from restaurants, caterers and food producers and distributing it to the needy. To date OzHarvest have kept over 5 million kilos of food out of Australian landfill and deliver over 13,000 meals a day to those who need it the most. So you ask, what can I do? There is a lot you can do to help, and it really doesn’t take much effort, just a little bit of thought. 1. Buy less food. With a little bit of planning you can buy just what you need to get through the week. Shopping “for the bomb” isn’t necessary because there will always be more food at the shops next week (I used to be a shop-for-the-bomb person). I love food shopping and I enjoy loading up my trolley as much as the next person, especially when I become inspired to cook, but these days I tell myself only to buy what I really need. 2. Plan. Each week before your grocery shop, open your pantry and fridge and look at what is already in there. Use these items up before they spoil, even if you don’t feel like eating them. The Greek grandfather of a childhood friend of mine always said it didn’t matter whether you ate beans or filet mignon, the outcome is always the same (you’re no longer hungry!). 3. Keep a whiteboard in your kitchen. I keep lists of what is in my pantry and fridge so I know not to buy more of what I already have. Otherwise you’ll end up with yet another box of taco shells you didn’t need taking up valuable space in your cupboard, especially if your pantry is small like mine. 4. Be creative. I have friends who complain they have no time to be creative but the kitchen is the perfect place to get those creative juices flowing. Throw together a beautiful meal out of what you already have. My own mother was amazing (and still is) at this. She could put together a spread out of seemingly nothing and it still inspires me on a daily basis. Give me a tin of beans, I’ll give you hummus! Give me a tired old capsicum, I’ll roast it and cut it into strips to toss through pasta. 5. Read books such as OzHarvest’s cookbook. A beautiful compilation of recipes from some of Australia’s best chefs and cooks all developed around using up leftover food. I recently purchased this book and have found the recipes and especially the beautiful photography and food styling to be highly inspiring. More great books are The Everlasting Meal by Tamar Adler and The Omnivore’s Dilemma by Michael Pollan. 6. Learn to be frugal and economise. Make your food purchases stretch as far as possible. I collect meat and veg scraps in a zip lock bag in the freezer and use them to make stock. For example if I peel a carrot the peelings go into the veg stock bag. If I buy fresh herbs I use what I need then chop up the rest and freeze them. Freeze BBQ chicken carcasses for making stock. 7. It’s what’s on the inside that counts. A staggering 40% of produce ends up in the trash because it doesn’t look “right”. There is an unrealistic consumer expectation that food has to look perfect on the supermarket shelf. Crooked cucumbers, spotty apples and marked tomatoes are just some of the beautiful produce being thrown away. Unless you’re styling the cover of Gourmet Traveller the fact that a piece of fruit is marked really is irrelevant. To prove point number 7 I went to my local greengrocers to see what they had on their seconds shelf. I bought a kilo of “marked” nectarines for $2 and made a beautiful chutney. 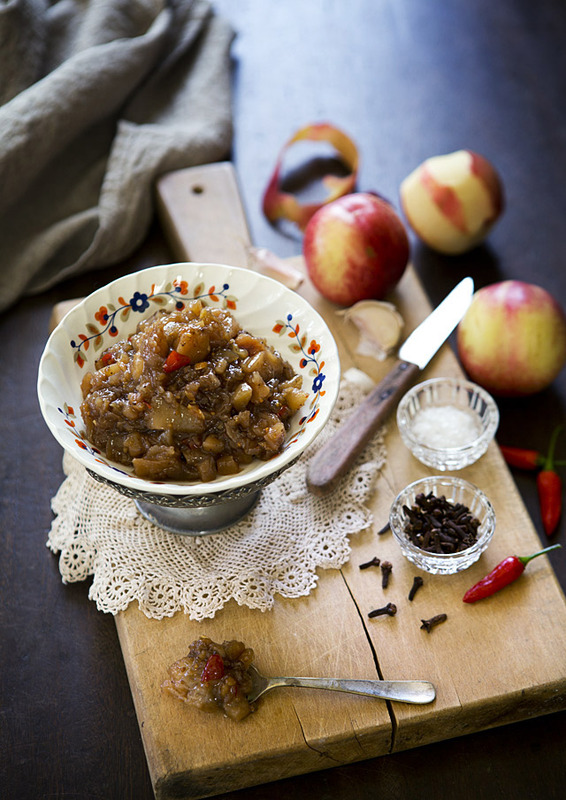 Spicy White Nectarine Chutney, is the kind of condiment which is amazing with meat, in a sandwich or eaten alongside cheese. It has a lovely fruity flavour with a good kick of heat from the chillis and warming spice from cloves, ginger and garlic. I always thought these types of recipes took ages to make and took a lot of skill, but let me tell you it’s easy. And it sure doesn’t matter if your fruit is perfect or marked, it tastes exactly the same either way: pretty darn good. Prep time: approximately 30 minutes, cooking time: approximately 90 minutes. Makes 2-3 cups. 1. Heat the oil over medium heat in a heavy bottom cast iron pan. Once oil is hot add the mustard seeds and stir until they start popping. Add the ground cloves, ginger, chilli and garlic and cook until mixture is very fragrant (approx. 2 minutes). 2. Add the nectarine pieces and onion to the pot and cook stirring for 5-10 minutes then add the cider vinegar, sugar and salt. Continue stirring for another couple of minutes. 3. Cook for around 90 minutes stirring at regular intervals until the chutney becomes jammy and caramelized. It will turn a lovely brown-honey colour and the fruit will be soft. The flavours develop further upon standing. I adore using recycled props in all my food shoots and this photograph was no exception. The lovely provincial bread board was picked up off the street in a council hard rubbish collection and the rest of the props are from various local op-shops. I love piecing together elements which on their own might appear to be garbage and making them into beautiful sets for food. The only light used in this image is window light. What do we waste? In NSW, we throw away $2.5 billion worth of edible food a year. In Sydney alone, the University of Western Sydney estimates that the $1 billion worth of edible food thrown away each year is equivalent to the income of all farmers in the Sydney Basin.